Whatever a person might think about how well SEGA treats its classic franchises and games, you at least have to admit that the company has a pretty good track record with cross-overs. Games like Fighters Megamix, SEGA All-Stars Racing, and SEGAGAGA seem to be excuses to dig out old beloved IPs that may not necessarily be strong enough to carry games on their own anymore, celebrating the company’s history in games that are solid, if not always spectacular. 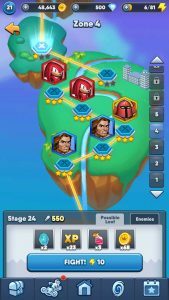 So hey, why not SEGA Heroes (Free)? Why not get in on the gatcha game craze with a rich library of characters that are known and loved around the world? What’s the worst that could happen? Ah, I love ominous opening paragraphs like that, don’t you? SEGA Heroes comes to us, I believe, from SEGA of Europe and Demiurge Studios, the same pairing that brought us last year’s Crazy Taxi Tycoon. The premise is sound enough. 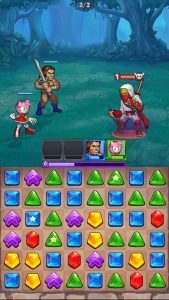 Put together a team of legendary SEGA characters and battle against groups of enemies in matching-puzzle gameplay. Use the resources earned from those battles to power up your team or get new characters, and try to tackle the next stage. Not the most original idea around, but neither was kart racing by the time the SEGA All-Stars got around to it, and that worked out fine. It doesn’t hurt that SEGA’s current mobile group has a real eye for the deeper cuts from SEGA’s history. Sure, Sonic and his dubious pals are here, as they are going to be in any endeavor such as this. But he’s not your first character, and unless you decide to break the game by throwing money at it, he won’t be your fourth or fifth or tenth character, either. Instead, you start off with Blaze from Streets of Rage. You’ll soon be joined by Ax Battler from Golden Axe, Ai-Ai from Super Monkey Ball, and Amy from Sonic the Hedgehog. After that, players are going to earn different characters depending on their luck and priority, but you can expect to run into familiar faces from Phantasy Star, Jet Set Radio, and even the PlayStation 2 Shinobi games. At the moment, only a handful of games are represented, but they certainly aren’t all obvious ones. In lieu of the variety of static art used by many games of this type, SEGA Heroes has each character rendered in a more or less uniform art style, complete with full animations for attacks, special moves, win poses, and so on. I can honestly take or leave the basic art style used here, but that’s a subjective thing so I’m not going to harp on it too much. At the very least, I love how the characters are animated and really appreciate that their special moves all fit so well. Ax Battler throws a bunch of potions in the air like a player who forgot that the A-button is for magic and not his basic attack, blasting the enemies with a dizzying earthquake. Amy whips out her Piko-Piko hammer and bops a foe on the melon. Joe Musashi leaps into the air and fires a fan of shuriken down on the enemy party. Each character has three special moves, so all of the abilities you’d expect to see are here. The fanservice isn’t just limited to the player characters, either. The stage backgrounds and enemies are all drawn from various SEGA titles as well. Unfortunately, whether they didn’t want to use it or simply couldn’t, no classic SEGA music is included in this game. The newly-created tracks are certainly evocative of SEGA games, but it would have been nice if the soundtracks of the original games were included here. Well, at least you have Alis Landale and Gilius Thunderhead team up with Gongon and Gum to defeat Robotnik and Mr. Big. That counts for something in my books. When I consider the possibilities for the future, provided SEGA keeps on adding content, I feel a little giddy. 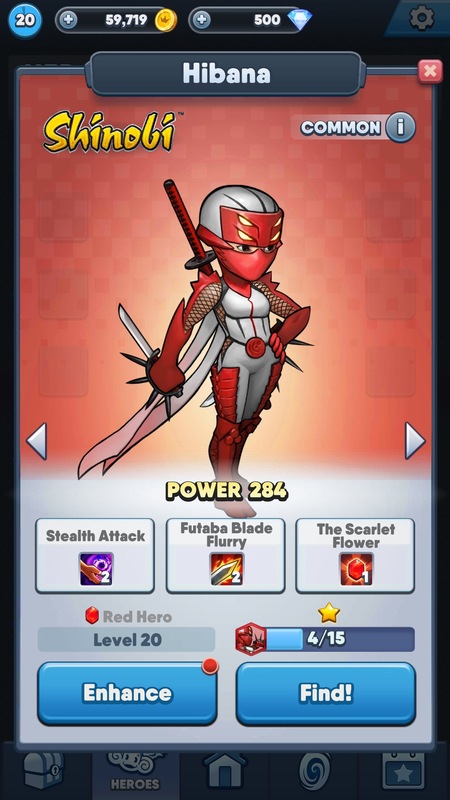 New characters are obtained by collecting character shards. You’ll find some of these as drops in certain clearly-marked stages. You can also buy them from one of the game’s few different shops, each of which has a rotating selection to offer at least once a day. Some shards will also be given as rewards for completing achievements, and this seems to be the easiest way to get Sonic on your team. Finally, you’ll also be able to pull some random shards out of chests. There are two chests that will pop four times a day each, with a cooldown timer that ensures you have to check in every so often if you want to get all the goodies. Shards are also used to increase a character’s rank, which makes them more powerful and allows them to enter more difficult stages. Along with rank, various other aspects of each character can be improved. You can spend coins to raise their level up to whatever your current player level is. 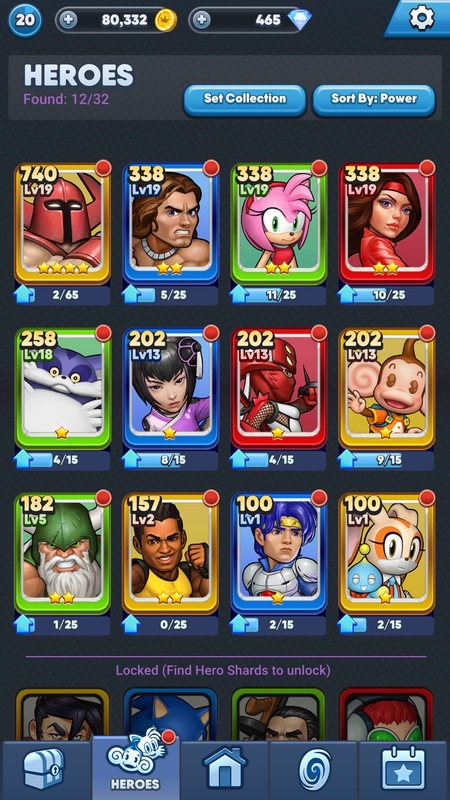 Collect materials and you’ll be able to upgrade their special moves. Every ten levels, characters will hit a cap, and you’ll need yet another type of material to bust through it. Some of these resources will be earned from chests, but your main source of them is to complete special event missions that rotate daily. I’m aware this is starting to sound complicated; regrettably I’ve just begun to explain all of this cruft. Each shop requires a different currency to buy things. The main shop takes coins, gems, or real money. You’ll get a fair amount of coins just by playing, though once you really get into the game you’ll go through them like water. 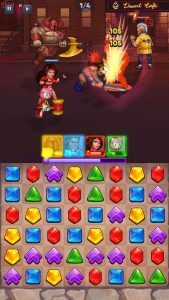 Gems come at a slower pace, but you’ll get some through chests and completing goals. Real money, I leave to you to figure out. The arena shop, meanwhile, wants arena coins. You earn those by playing the game’s arena mode, where you face off against another player’s team. Each attempt at the arena requires an arena key. You’ll be given three each day, and you can buy more using gems. As you defeat other teams, your rank will rise, which results in increasingly nice daily bonuses. Then there’s the survival shop, which takes survival coins. You’ll earn those by playing survival mode, which requires a survival key. Those replenish at a rate of one per day, or you can shell out some gems to buy some. Options everywhere. One good thing is that the event missions, arena, and survival mode do not use any of your stamina. Oh right, there’s a stamina meter in here, too. It refills dreadfully slowly, but most chests will drop some stamina into your gauge, which mitigates that a little bit. That stamina is used for the game’s main story mode, where you’ll play through pre-set stages as you make your way through each zone. Each zone yields shards for two or three different heroes, and you’re probably going to be farming those quite a bit. 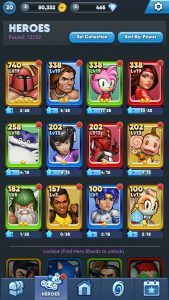 You’ve got to keep your main team competitive if you want to get anywhere, and you’re going to need lots of shards, coins, and materials to keep up lest you hit a very hard wall. Luckily, the game offers a kindness in that once you’ve completed a level with three stars, you can simply farm it in exchange for the requisite amount of stamina at the tap of a button. This will drain your stamina in seconds, but at least you don’t have to spend your time re-doing the same stages again and again. Because here’s the spanner in the whole works, even if you’re familiar with and can tolerate all of that stamina, key, gem, and material nonsense: the core gameplay just isn’t very good. It’s a painfully slow and simple variation on Bejeweled. You match one piece at a time in a playfield that’s really too small to offer a lot of strategy, then watch the pieces slowly fall into place. If you make big matches, you’ll earn a star piece, and if you match that, you’ll use a special move. Each character corresponds to a particular color, and making a match in that color will trigger their attack while also filling their super meter. Once that’s filled, you can tap their portrait to use their special moves. I just can’t find this kind of puzzle all that compelling in a post-Puzzle & Dragons world. Thanks to the small height of the playfield, I feel like my outcomes are determined far more by whatever faux-random routine the computer uses to chuck new pieces into the field than by anything I’ve done. And it’s just. So. Slow. It’s too bad, because I can get around all that other jazz. It’s commonplace at this point, so whatever. I’ll go get your 25 red fleep-floops and sixty-three magic gems to raise my axe swing to level four or what-have-you, because that’s just how this stuff goes anymore. But I have to at least enjoy the battle portion, because otherwise this is just a lot of annoyance for nothing more than a few half-hearted strums of my nostalgia strings. 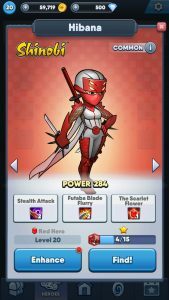 It’s not that I hate the puzzle gameplay in SEGA Heroes, but it doesn’t do a thing for me. It’s something I deal with to get the goodies that allow me to collect my favorite characters, and I can’t help but feel that’s the wrong way around. That’s why, in spite of how well I feel they handled the fanservice and presentation, I can’t recommend this game with much vigor. If you like SEGA, you might want to rotate SEGA Heroes in as your game to play when you only have a few minutes to kill and don’t want to put in a lot of effort. In that context, it’s innocuous enough, and every so often you’ll get to add Knuckles to your party, so that’s cool. But I wish the core puzzle gameplay had had half as much thought and attention to detail put into it as the monetization systems seem to have received, because then we might have something pretty great instead of a generic game with a lovely SEGA label slapped on the tin.